Life is HARD (can I get an ‘amen’?). Life TOGETHER can be harder. I’m sorry to have to tell you this, but today’s topic is DISCIPLINE. I know – we’re as crazy about discipline as a biting toddler or a teenager whose driver’s permit is burning a hole in the wallet. Spiritual discipline, as with parental discipline, well – it’s part of being in the FAMILY! Those of you with children know that kids NEED their LIMITS! Children need to know where they stand and what they can and cannot do, for their safety and for their well-being. Isn’t that what the child development specialists teach – the need for ‘healthy boundaries’? We, like David, are children in God’s family. And we come together as a family of faith looking a lot like a collection of pottery, formed by the Master’s hands. Only, some of us are cracked. Maybe just a chard or a piece of something that used to hold water; that used to be whole. We come together AS A FAMILY and we know that LIFE IS HARD. But LIFE TOGETHER, well, sometimes that’s even HARDER. I imagine that this is what prompted Jesus to give His followers a ‘prescription’ for how to handle conflict in the church (Matthew 18:15-20). Jesus KNEW what all of us KNOW – that LIFE TOGETHER is HARD. Any group of people can be a community. Jesus teaches us that the distinguishing factor – the MARK of togetherness in the Body of Christ – is that when we come together IN JESUS’ NAME, HE HIMSELF is here, with us! The idea here is not unlike what happened in the books of Exodus and 2 Chronicles, when the presence of God Himself came to dwell in the midst of His people. The Hebrew word for it is Shechinah, which means ‘the special presence of God’. When God Himself came down to the people, His presence (like a cloud) filled the worship space! His glory was so powerfully present that in these two stories, Moses & the priests couldn’t even enter the sanctuary because God had filled it UP with HIMSELF! When we gather in His Name, Jesus’ own presence is like that! His glory is so complete that what we thought we were there to do is often consumed by HIS agenda, HIS direction, HIS energy, HIS PRESENCE! When Jesus comes to church, or to Bible study, or to a meeting where the common denominator in those attending IS HIS NAME, He makes our time together something OTHER THAN what we would have made it on our own. And this is why Jesus’ words in Matthew 18 work – because when 2 or 3 believers get together in His Name, Jesus Himself is there. He fills us with His presence and we become part of what He is doing in the room. Two people who disagree CAN work things out when they both have Jesus’ Name on their lips and His Spirit in their hearts! Jealousy. Anger. Fear. A problem or relationship or issue that we’ve allowed to take precedence over Jesus’ Name. That’s why Jesus gives a Step 2 and a Step 3 – and even a Step 4 in our Matthew text; because even in the church, we sometimes forget why we’re here in the first place. We forget that this isn’t about me, or you, or even US. It’s about HIM. When we make our gatherings about Jesus, His presence not only changes how we talk and what we find important enough to talk about, but His presence changes US. We’re somehow BETTER when He is here! But Jesus’ presence goes beyond affecting our behavior toward one another. What Jesus DIDN’T DO is lay out a bunch of rules and regulations and then say, “See ya! Good luck with that!” and walk away. When the Spirit of God comes to live inside of us, He doesn’t coexist with our selfish needs and desires… HE FILLS THE TENT! And in filling us up, we’re left with the PROOF of His PRESENCE – the evidence that He is here and we belong to Him… and that evidence is: LOVE! The main thing is to keep the main thing the main thing: and the MAIN THING IS: LOVE! According to Paul’s letter to the church in Rome, LOVE fulfills the law. LOVE is the only debt we owe to one another. When we LOVE another person as we love ourselves, we can do them no wrong. When we wring out the details and get down to the nitty gritty, ALL of the commandments can be summed up in this word: LOVE. After all, Paul says all we have to do is love each other & it will be impossible to sin! Sounds great! Simple! Tempting, though, to throw up the love ‘blinders’ and ignore, well, EVERYTHING ELSE. Where GOD is, LOVE is. And where LOVE is, LIGHT SHINES. Love’s light shining on God’s Word illuminates His teachings, His commands and His ways SO THAT we see the path clearly before us, like David prayed in Psalm 119. God’s WAY is exposed by the light of love, and by the way – so are the obstacles and the temptations that threaten to trip us up and stop traffic on the road. 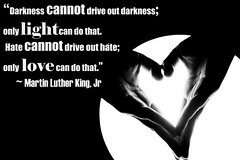 Love’s light shining in community makes us BETTER than we ARE! And it’s BECAUSE of love that we don’t ignore the struggles we have with people. Otherwise, why would Jesus have given us tools to work through these problems with others? As parents of earthly kids and as brothers & sisters in faith, we WANT each other to be well prepared for life, and we KNOW this means we will all make mistakes. If we’re to learn from our mistakes, well, we have to take responsibility for our part in those mistakes. In this family that is the church, when we excuse one another’s bad behavior and take on the burden of someone else’s poor decisions, we aren’t doing anyone any favors! Instead, we are called through voices like Paul’s to ‘lock in our empathy, love and understanding’ (Love & Logic) from the word ‘go’, BEFORE the consequences of our actions roll out. That way, when all is said and done, we KNOW that we are LOVED. No matter how clumsy we are. No matter how far we’ve strayed. No matter what harm may have been done. We know – ALL of us know – that LIFE is HARD. And let’s face it – there are times when LIFE TOGETHER IS HARDER. But when two or three or more of us gather in Jesus’ Name, His presence can change all of that. And when we’re marked by the proof of His presence – when we are marked by LOVE – the light that shines from the Word into our lives has the power to clear up our confusion, to heal our relationships and to make us BETTER than we ARE on our own. Now, that’s a message I don’t want to hear again. Listen to this message as recorded on Sunday, September 4, 2011: Life Together. It’s hard to tell the difference sometimes. The recent “It Gets Better” campaign on YouTube features celebrities and leaders, like President Obama and ELCA Bishop Mark Hanson, encouraging bullied teens with the sentiment that life for those who are different somehow “gets better” with age. As much as I want to believe the inspirational video clips, and as much as I would love to see teenagers turn the other cheek in hopes that one day the bullies will grow up and repent, I don’t have to look very far from my front doorstep to see that adults are setting the bar pretty low when it comes to respect for the dignity and humanity of others. Sometimes teenage bullies just get taller, drive more expensive cars and buy houses in the suburbs. What’s a follower of Jesus to do? Some of us choose silence. Some of us choose a side. Some of us have no choice. Love for the rude and insulting. Love for the cruel and the angry. Love for the overlooked and ignored. Maybe it doesn’t really get better for those of us who are different, who don’t fit in. But maybe it can seem better over time, because the more we’re exposed to the fiery darts of the haters, the thicker our skin becomes. The lower our expectations are. The less surprised we allow ourselves to be by the looks and the whispers and the fingers that point. Maybe it’s time we stop blaming teenagers for the failure of our families, our churches, our communities and our world to set the standard of care for others at least as high as the standard of care we expect for ourselves. Church! We can do better than “It Gets Better.” We can be more than just a talking head. Bullies may wield a big stick and words intended to wound, but isn’t that what we’ve come to expect from this world? I’m tired of cowering in the shadows, afraid of catching the bully’s eye! You may choose to pick a side. But from this day forward, I MUST CHOOSE LOVE.